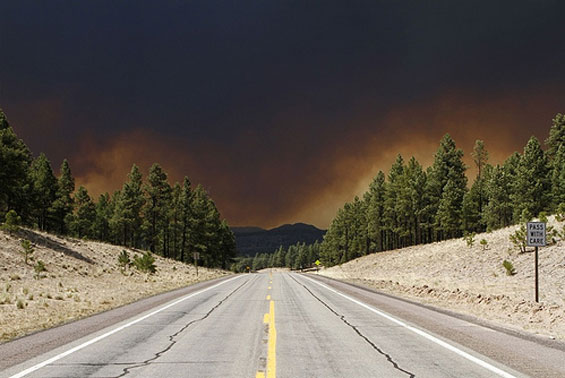 Wildfires Burning, but Arizona Home Insurance Buyers Urged to Get Flood Insurance? Wildfires continue to rage all over Arizona, and news agencies ABC15, CBS5 and AzFamily report progress as each is managed and eventually extinguished. When the wildfires are gone, so is the Earth’s natural protection. The loss of underbrush and rooted plants can cause many problems. You would think that the primary concern for homeowners in regions prone to wildfires would be to carry homeowners coverage to protect their buildings and personal property. Wildfires destroy vegetation such as underbrush and trees. The loss of this vegetation through intense fire leaves only charred ground. Ground that is burned no longer has the ability to easily absorb water. The increased run-off of rainwater can cause mudflow or flooding. The areas at greatest risk are downstream or downhill from burned areas.. The risks are more substantial during spring thaws, heavy rains, or winter storms. From 2002 to 2011, total flood insurance claims averaged more than $2.9 billion per year. In high-risk areas, there is at least a 1 in 4 chance of flooding during a 30-year mortgage. However, losses due to flooding are not covered under typical homeowners and business insurance policies. How can homeowners protect themselves? Avoid loss of life or injuries, evacuate. Planning ahead for a safe location to move out of harm’s way ensures that there is no loss of life. Important papers and valuables should be kept in a waterproof safe, or in a waterproof place such as a safe deposit box. Take an inventory of your assets. Photos and descriptions will help you estimate your losses if you are affected by a flood. The real solution? Flood insurance. When homeowners examine their current policies they find that they must purchase separate coverage for flood-related incidents. 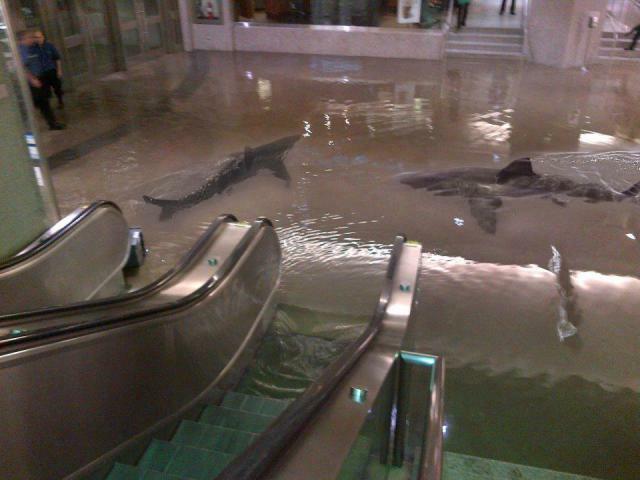 Ultimately, the best solution is protection through a flood insurance policy. As homeowners insurance specialists, we understand the needs of our region- this is our home, too. Our goal is to help you assess what coverages you need, whether you have the right coverage in place, and to fill any gaps that exist in your homeowners policies. We know that expenses after a flood can cause high out-of-pocket expenditures, and we want to help you reduce your risk of loss. Whether you live in a high flood zone or one that is less at risk (incidentally, more than 20% of claims come from low to moderate risk areas), there are solutions. The purpose of having homeowners insurance is that you’ll be covered in the event of an emergency. So how covered are you? The answer might surprise you, as there are a number of things your policy might cover that you hadn’t thought of before. If you’re worried about stampeding animals invading your home, you’ll be glad to know that this is typically covered as well. This coverage is normally for animals that you don’t personally own. If you live next to a ranch or farm, you could benefit in the event your neighbor’s livestock gets loose and suddenly invade your property. Other animal damage could be included as well. In the event a skunk discharges inside your residence, you could be entitled to money that would help you with your cleanup efforts. Water damage from broken pipes isn’t the only thing that’s usually covered. Aquarium breaks and bursting water beds can also be included in many policies. In order to file a claim, you must usually assert that these items were maintained and stored properly within your home, yet failed to operate as expected. Every insurance policy is different so not everyone will have the same coverage for these unusual events. Even so, it cannot hurt to contact an insurance agent if you inadvertently suffer a property loss due to no fault of your own. For more information about the different policies that are available, contact us today. Although home insurance will provide coverage for your home in case of a disaster, the best way to avoid home damage is to engage in preventative measures. Many disasters, natural and artificial, may be avoided by making some extra effort. By taking some tips from insurance agents, implementing these measures should be possible in no time at all. The first step is to investigate the most frequently occurring natural disasters in your area. Different parts of Arizona will tend to suffer from higher rates of specific disasters than others. For example, some areas will be more prone to tornadoes and floods while others will have a high rate of earthquakes. In some cases it is possible to purchase specialist insurance which only covers one type of disaster or incident. Take the time to meet with local insurance agents for some tips. The broad policy covers all the perils covered by the basic plus: building collapse; freezing or accidental discharge of water, or steam from within plumbing, heating, or air conditioning systems and domestic appliances; falling objects; weight of ice, snow, or sleet; and rupture or bursting of steam or hot water heating systems. The special policy covers dwellings for “all risks” except certain specified perils, such as earthquake and flood, and coverage for damage to personal property caused by any of the perils covered by a basic or broad policy. For an additional premium, a special endorsement usually can be added to extend the special policy to provide “all risk” coverage on personal property that is normally limited or excluded from the policy. There is even a comprehensive package which is rarely sold today that covers almost any possible damage to your home that is imaginable. Deciding which insurance policy is right for you should be influenced by the overall value of your home as well as which accidents or disasters you feel are most likely. Make changes to your home that will help prevent damage from occurring in the first place. Some good examples of these changes may include installing new piping, roofing, or a lightning rod. These home improvements can prevent damage from leaking pipes, mold, and even fire. Some other examples of preventative measures include reinforcing your home’s foundation to help resist a tornado or installing fire resistant insulation. Many insurance agents will agree to give you a discount on home insurance for installing such precautions in your home. Be sure to mention all of these facts when signing up for insurance. Some agents will also agree to give you a discount based on other factors such as a high credit score or a claim-free history. Buying insurance can be challenging, but with the right know how, getting a discount should be achievable. Water damage is a primary cause for claims against homeowners insurance in Arizona. Even a paid claim cannot adequately compensate you for the time and aggravation of dealing with water damage, so we want to help you avoid this issue. Let’s start by addressing potential water damage to the exterior of your home, or your neighbor’s home- during rain season. The major factor in avoiding exterior water issues is the slope of the ground surrounding your house. Six inches in slope for every 10 feet, or a grade of -2% to -5% is considered ideal for drainage, but you must make sure your excess water does not drain into your neighbors’ yards. Another factor affecting drainage is the amount of concrete around your house in the form of driveways or patios. Water that hits concrete has got to drain off somewhere, so you need to control that flow. A good solution may be to replace some of that concrete with pavers. Lay drainage pipes underneath the pavers, or install French drains. Always consult with a licensed contractor to make sure your renovations meet codes. See that your roof is in good shape. An inspection every two to four years is adequate unless there has been severe weather, in which case you should have someone look at it right away. Damaged shingles or missing flashing indicates the need for repairs. Go up to the attic during the day to look for spots of daylight coming through the roof. Water spots on room ceilings or walls call for an immediate roof inspection. Finally, see that your home is equipped with gutters and downspouts. Not only do they safely channel excess rainwater, they protect landscaping and add aesthetic appeal. Now let’s look at how to head off interior water damage. 1. Monitor water use. This sounds elementary until you realize that a significant amount of water damage is caused by overflowing tubs, toilets and sinks. Make sure that sinks are equipped with overflow drains. Always supervise children in the bathroom and kitchen. 2. Fix malfunctioning appliances immediately. A constantly running toilet is a disaster waiting to happen, and when it finally gives, it will do so in the middle of the night. Water heaters that are 10 years old or older should be replaced. Not only will you head off a sudden 50 gallon deluge, you will enjoy the savings of new energy efficient models. Inspect your dishwasher door’s seals or gaskets, and replace them if they are hard or cracked. Periodically check your washing machine’s drain hose to see that it is clear and uncrimped to the stand pipe (you’d be surprised what sometimes happens to those missing socks). 3. Dehumidify wet basements. Control minor seeping with an oil-based masonry waterproofing paint. Major seeping problems may have to be addressed with a French drain or other pressure relief systems. Get expert advice on this. 4. If you live in an area that experiences freezing temperatures, protect your pipes by covering exterior spigots and allowing interior faucets to drip during cold spells. 5. Know where your home’s water shutoff valve is located and how to operate it. Should you experience sudden flooding from a water supply line failure, shutting off the water quickly will mitigate damage. Contact any one of our insurance agents, they will be glad to help. You’re looking for home insurance for your Arizona home. Perhaps you just moved to the state or you’re a first time homeowner. Either way, you’re unsure about what things to consider when you purchase insurance for your home. What types of coverage do you need? How can you avoid paying too much? What should you look for in a homeowners insurance policy? Here are three things that many homeowners rarely consider when they buy home insurance. Many times when people buy their home, they look for a great area, with friendly neighbors, close to schools or shopping. However, the MSN article, “10 Things That can Lower or Raise Your Homeowners Insurance Rates,” suggests looking for a home near a fire department. According to the post, if your home is over five miles from a fire station or fire hydrants, your insurance rates may be higher. Additionally, items such as swimming pools, trampolines, and play equipment can cause injuries, thereby raising your rates. Whether it’s a fire or an injury, keep safety in mind when you consider your home. Most people don’t consider that the land their home sits on isn’t at risk from theft, fires, or other hazards. Therefore, they shouldn’t include its value in deciding how much homeowners insurance to buy. Otherwise, you could pay a higher premium than you should. Your insurance agent can help you decide how much dwelling coverage to buy. Your coverage should equal the full replacement cost of your home. Replacement cost and market value are not the same. The market value includes the price of your land and depends on the real estate market. Becoming a homeowner means an increased level of responsibility. That responsibility not only includes paying your home mortgage, home insurance premium, and taxes, but it includes maintaining your home and property as well. Maintaining your home not only can save you money on the cost of your home insurance, it can keep the expenses of maintaining your home low. Additionally, as a responsible homeowner, maintaining a solid credit history can help keep your home insurance costs in check. More and more insurance companies are using credit information to determine the cost of home insurance. Generally, they must advise you if there is any adverse action – like a higher rate. Your best course of action is to keep your credit in good shape by paying your bills – like your home mortgage and insurance – on time and by not getting more credit than you need. And don’t forget to check your credit report regularly for problems or errors. You can check it for free once a year. For more information on home insurance, check out this guide from the Arizona Department of Insurance or visit our website. Haboobs, micro-bursts, monsoons, flash flooding and wild fires; where in the United States can all these be found? In my hometown of Mesa, Arizona, that’s where. The Phoenix Metropolitan Area is considered the second safest area in the US for natural disasters, and yes, we do not have hurricanes or cyclones, but those aforementioned weather conditions can and do happen here in the Valley of the Sun. 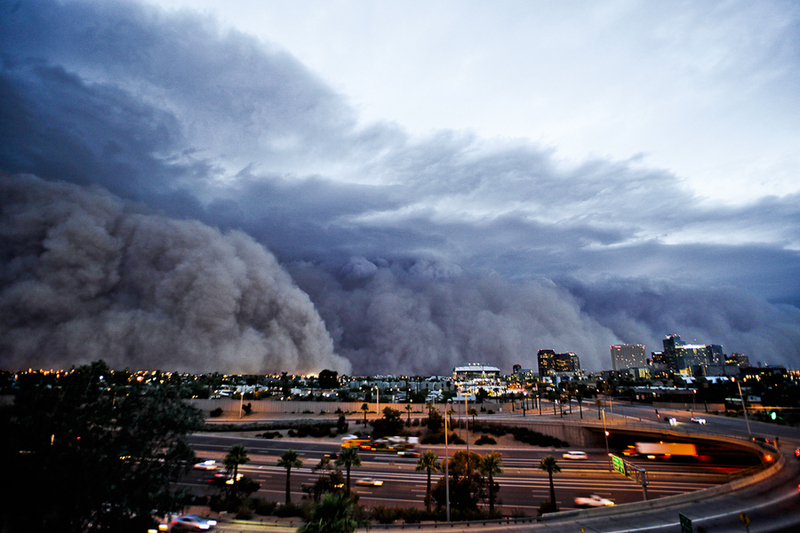 A Haboob is an intense, massive dust storm that rolls through a desert area picking up sand and dirt. If you have never seen one, it resembles a Tsunami on land. Micro-bursts are the southwest desert area’s equivalent of a tornado. A whirling, swirling little burst of energy that dips and plunges sporadically, and can do quite a bit of wind damage. For a dry, arid community, most people here carry flood insurance. Because our land is so dry, a huge downpour of rain, especially during a monsoon, does not soak into the earth fast enough, and creates rivers and lakes where once there was a nice arroyo or street. Wild fires in the country always make the news; devastating and damaging, we in the valley are usually spared, but the higher elevations of Arizona surrounding Mesa have wild fire warnings out in the intense summers of excessive heat. Homeowner insurance in Mesa is very important. A few years ago, on the unique date of 10-10-10, a micro-burst of large proportions came bustling through Mesa and took a huge chunk of my roof and damaged several other homes in the area. My home insurance saved me from being homeless. With a quick call to the agent, an estimator was there within hours and a check for the repairs was in my hands within a week. I now have a very safe, very new, shingled roof. Even though we carry insurance coverage and have peace of mind from having no place to stay and losing a large piece of equity, taking safety precautions and keeping the home as safe as can be is a smart move. Personally, even in our holiday season, I turn off the holiday lights when I leave for a long length of time; I have heard of too many fires being starting by faulty Christmas tree lights. Another way to prevent electrical problems and potential fires due to overheated air conditioners here in the desert, is to hose the outside units down thoroughly after every dust storm, and/or haboob rolls through. The Valley of the Sun is a beautiful area to live in, especially in the mild, sunny winters when most of the country is struggling with ice and snow. It is true we will never have to worry about ice storms, snow on the roofs and freezing pipes, but each area of the unique United States topography carries with it some type of dangers to our homes. Talk to your home insurance agent, who is an expert in your area. Even though Hurricane Sandy wreaked havoc on the East Coast, thousands of miles away from Arizona, anyone with a home in the state might be thinking about flood insurance. Well, here’s some good news. According to The Arizona Republic article, “Reminder to review insurance,” insurance companies focus on “in-state hazards” when they set their prices, so Hurricane Sandy won’t have much effect on the cost of insurance in Arizona or other parts of the Southwest. Rates are set according to risks, and natural disasters in Arizona don’t include hurricanes. In fact, homeowner-insurance costs in Arizona are moderate. The latest tally by Homeinsurance.com puts the average premium here at $617, compared with a U.S. average of $853. In addition to natural disasters, property values, building costs and other factors have an impact on the cost of insurance premiums. Disasters like Sandy remind us that it’s smart to take time to make periodic reviews of our insurance coverage. Standard homeowner insurance policies cover damage and injuries caused by most natural disasters. However, floods are a notable exception. 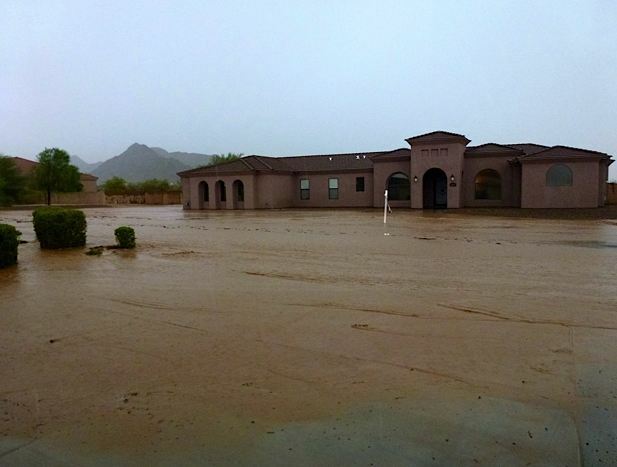 Arizona has more flood-insurance policies in force than most states. There have been five federal flood declarations in the state since 2000. Winter storms, summer monsoons, and flash floods in wildfire-charred areas caused the floods. If you live in a flood plain, FEMA makes sure you’re covered. Not so for far too many residents. A flood plain by definition is dry most of the time, but it fills with water temporarily. Consider the Salt River basin, the area in which we live, its put residents at risk of flooding for thousands of years. The federal government decides who is and is not eligible for flood insurance. You can check with your policy provider. You may get some relief from flood damage through special government grants or loans, but only if a disaster is declared. Therefore, having coverage is helpful for covering damage from flash floods and heavy rains. The National Flood Insurance Program is the main source of coverage for flood insurance. The NFIP site lists the names of local agents who sell policies. Premiums don’t vary by company. If you decide that flood insurance is something you want to add to your policy, annual premiums are about $400 in low- to moderate-risk areas. Contact your insurance agent in Arizona to see what options they have to best insure your home against an Arizona Flood. With a wide variety of insurance to choose from, finding the right policy for your coverage needs can be difficult. Everyone knows that Arizona is a state which has a very low rate of natural disasters. This can make finding the right insurance agent for your personal situation challenging, since the probability of a certain disaster occurring will likely depend on your specific area. Take the time to do some research about the statistics concerning disasters in your area. This knowledge will help you later when you are building your insurance portfolio. A good insurance agent will tend to have a reputation. Only work with an agent that has proven themselves to a client base in the past. The specific agency or company is also very important to consider. Investigate how often they deny claims, exactly how much coverage you get for what you pay, as well as the specific technicalities that allow agents to deny your claim. 1) In case an individual suffers an injury while within the premises of your property, legal damages are taken care of by the coverage provider. 2) In the scenario that a calamity renders your home uninhabitable, the coverage provider shall monetarily assist you to live elsewhere. These two aspects are very important to consider as a person purchasing insurance because they cover you legally in the case of the unexpected. This makes it very advantageous to own home insurance, because in the event that someone is injured on your property you will not be held responsible. If your home is damaged or destroyed, the insurance company will need to temporarily fund a place for you to live in. It is very important to realize that most typical insurance policies do not cover against natural or freak disasters, such as a nuclear disaster or natural disaster such as a hurricane or earthquake. While the incidence of natural disasters tend to be low in the state of Arizona, it is still possible to purchase additional protection by investing in a specialist policy. Always take the time to compare several different policies before settling on the one that is right for you. Taking the time to evaluate different policies based on factors such as the cost, coverage provided, and previous customer satisfaction rate is absolutely essential. Never make the mistake of simply working with the first insurance agency that you come across. Look for potential deductions that you can use to save money on a policy. Although it might seem like a certain policy costs more, you could actually end up spending less by using the various deductions that are available. Deductions are often based on factors such as the amount of claims you have previously submitted, as well as other factors that tend to decrease the chances of you filing a claim. Use deductions that other insurance companies offer as a negotiating edge. Contact any insurance agent in Arizona and they can guide you through this process. With such a diverse array of insurance options to choose from, finding the right insurance for your personal needs can be difficult. The only way to truly ensure that you are purchasing the insurance policy you need for the price you are willing to pay is to educate yourself. There are some basics worth considering when buying insurance in this state. It is important to understand that Arizona is home to a very diverse array of natural disasters. These include dust storms, earthquakes, land slides, flash floods, and tornadoes, just to name a few. Take the time to do some research about the disasters that occur most frequently in the area of Arizona where your house resides. These statistics should help immensely when deciding which policy is right for you. According to the Western Farm Press, “The U.S. Department of Agriculture has designated 5 counties in Arizona as primary natural disaster areas due to damage and losses caused by ongoing drought and related disasters that began Jan. 1 and continues”. Knowing the disasters which specifically tend to affect your county is crucial. While it is possible to buy insurance that covers your home in the case of a specific disaster, it is often easier to buy a comprehensive package which covers your home in the case of the most common natural disasters. Although these comprehensive policies can be expensive, they offer peace of mind. The worst thing that can happen is for a different natural disaster to occur than what you are specifically covered for. There are other precautions besides purchasing home insurance that should be taken into consideration. An ounce of prevention is worth a pound of cure. One of the best ways to prevent a disaster from damaging or destroying your home is by taking some simple precautions. Meet with your agents to discuss some simple home modifications that can help prevent you from having to file a claim. Simple things like installing a lightning rod to prevent fires, installing a sump pump to prevent flooding, and strengthening a foundation can go a long way. Evaluate the worth of your home before deciding to purchase a policy. Many people don’t take a close enough look at exactly how much coverage a specific home insurance policy provides. If you aren’t sure how much your home is currently worth, hire a professional to assess its current value. This will help ensure that you don’t overpay or underpay for your policy and are getting the exact amount of coverage that you need. A good home insurance policy will also provide deductions based on various factors. These could include paying your bill on time, living in a low-risk area or simply because you have been a customer for a long period of time. Deductions can help you save a lot of money in the long run on the cost of your insurance. Do your research to help find out which insurance company can provide you with the most deductions. Also, when a disaster does strike, big or small such as a fire, water damage, or mold, we can help get you storm damage clean up providers. It’s a sign of the times. A recent news report from Arizona’s abc15.com tells the heartbreaking story of a young woman trying to save money. A young woman was in the process of foreclosing on her condo. She was packed and ready to move. She had cancelled her homeowner’s insurance policy just before a fire burned down her condo and caused damage to two other units. As a state with a history of hot, dry weather and raging fires, many residents know how easy it would be for their property to go up in flames. That’s why it is important to take every precaution possible to protect your home by having the right insurance policy. Don’t take chances. Don’t think it will never happen to you. Take the right steps before anything goes wrong. Never cook when you are drowsy. Keep combustibles at least three feet away from heat sources. Never smoke when lying down. Test your smoke detectors on a monthly basis. Replace smoke detectors every 10 years. Develop an escape plan and practice it every six months. Equip your home with the necessary safety equipment, such as smoke detectors, escape ladders, and fire extinguishers. Sleep with your bedroom doors closed. If a smoke detector goes off during the night, feel the bedroom door with the back of your hand before opening it. If it is hot, do not open it. Make sure that you are able to contact the fire department from any room in your house—in case you are trapped. Replace the batteries in your smoke detectors and carbon monoxide detectors every six months. Be careful not to overload electrical outlets. Unplug appliances when they are not being used. Schedule an annual home-fire safety inspection. Make a list your belongings and valuables. Take photos of every room. Keep a copy of documents off-site. Preparing in advance will help get your insurance claim settled faster. After a fire, don’t enter the house without an okay from the fire department. First, you want to make sure the blaze is out. Second, you need to ensure the structure is sound. Call your insurance carrier right away in order to start the reimbursement process. Additionally, your insurance agent can assist with other needs such as emergency lodging, hiring a cleanup crew, and the steps you need to take to rebuild. 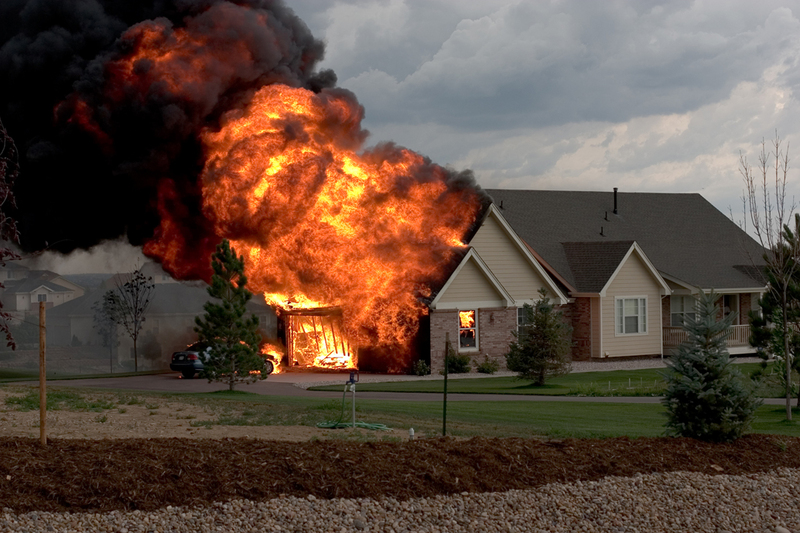 Homeowners insurance typically covers you in case of fire, except when they prove arson. If you’ve done your due diligence, you’ll have documentation to support your loss. Speaking of documentation, be prepared to provide the insurance company with copies of your inventory list and photos or videos of your possessions. Obtain a fire report from the fire department. If you home isn’t completely burned, secure any personal items to prevent looting. Otherwise, your insurance company may hold you liable for its replacement. Dealing with a home fire is devastating. What is even worse is not having the right insurance coverage if this happens. Make sure your policy is up to date today by calling your insurance agent!